State lawmakers could learn something from our congressional representatives, who are accomplishing something even though they’re in the political minority. 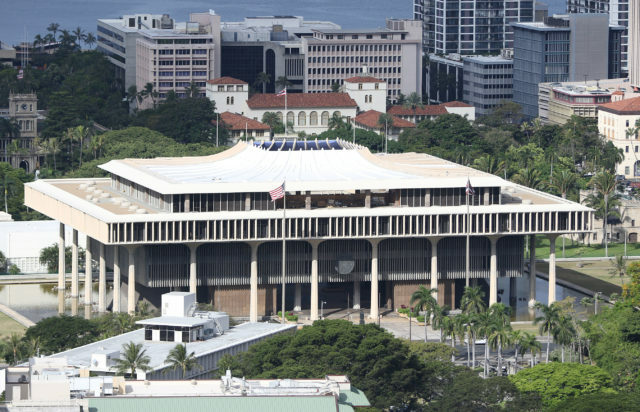 As the Hawaii Legislature folds up its tent and members go home to do whatever it is they do the rest of the year, I wonder if they feel it was time well spent. Like most of us, I keep up with the legislature the way I keep up with the weather — I read the headlines, check the temperature, and only pay close attention if there’s a major threat looming. It’s Hawaii. The weather — and the Legislature — rarely packs a punch that merits close attention. Or maybe it does, and I’m not paying enough attention. What came out of the Capitol this legislative session was a muddled mess. After the January inauguration of a man who seems to prefer Twitter to textbooks, instinct to intel, I joined up with what would become known as Hawaii’s resistance. Every Tuesday, we descend on our congressional members’ offices — Sens. Brian Schatz and Mazie Hirono and Rep. Tulsi Gabbard at the Federal Building and Rep. Colleen Hanabusa in her downtown digs — and we talk story with the staff. And with the exception of Gabbard, when the member’s in town, we talk story with them too. Like the rest of Hawaii, we’re a mixed bunch — doctors, lawyers, teachers, entrepreneurs, nurses, retirees, students and one exotic dancer. Many are old-time kamaaina; some are transplants. A few are active duty spouses. Our youngest isn’t quite old enough to vote, and our oldest hover in their 70s and 80s. For 15 weeks now we’ve visited them, and we’ve watched their transformation. While Schatz initially said he’d give the president a chance to seat his cabinet, his course soon shifted and he stood with the resistance opposing the ill-informed and corrupt nominees put forth. While Sen. Hirono initially preferred to let her floor vote signal her views, we soon saw her taking to MSNBC and Twitter, making it clear that an Asian immigrant from Hawaii wasn’t going to stand for this. At her recent town hall, Congresswoman Hanabusa referred to us as “My Tuesday people who come every week,” concerned about this administration. She invited everyone else in the room to join us. This week, when the president’s budget finally hit Capitol Hill, our delegation dug in, and Civil Beat correctly reported that “Hawaii Got Almost Everything We Sought in the Federal Budget.” Maybe this happened because this White House caved, or because we show up in our members’ offices every week. Maybe it happened because Hanabusa, Schatz and Gabbard faced town hall crowds last month and promised they’d do what they could. Maybe it happened because this administration can’t seem to find its way to a solution even as it controls all elements of the federal government. My money is on all of these things, and more. Our members of Congress have demonstrated a renewed commitment because they know this stuff is important, it’s now or never, and our eyes are on them. Back here at home, though, not so much. While our Legislature fiddled and futzed with rail funding — the issue they still can’t figure out, no matter how hard they say they try — they managed to bog-down, botch and otherwise befuddle a whole host of issues critical to Hawaii. Maybe they’re right. It’s not always easy to understand how things work over there since so much goes on behind closed doors. Some sunshine in those rooms would help. We need to be there, too. We need to show up, not just on election days, but at hearings, in offices, at the meetings. We elect these guys, and then give them a free pass until the next election, and then elect them again. We can fix that. Quartz reported recently that Hawaii has emerged as a leader in the Trump resistance, no surprise given the state’s deep history in ground-breaking work on Title IX, diversity and health care. These are not ordinary times, and we expect our legislators here and in Washington to demonstrate strength, vigilance and focus on the issues that matter right now — for our state, our people, and our islands. The bickering, feuding fogging mess that our state Legislature calls governing isn’t working, and our people and our islands deserve better. “Wait ‘til next year” is no longer good enough. And really, it never was. Powell Berger is a Honolulu-based writer, strategic communications consultant, and long-time political observer. Her work appears in numerous publications. She lives in Kakaako.